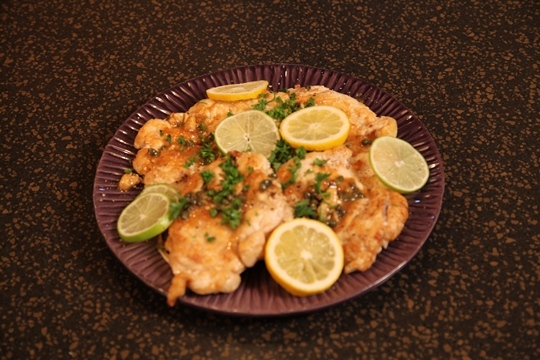 Chicken Piccata sounds like it would be too fancy to make at home, but that is not so! 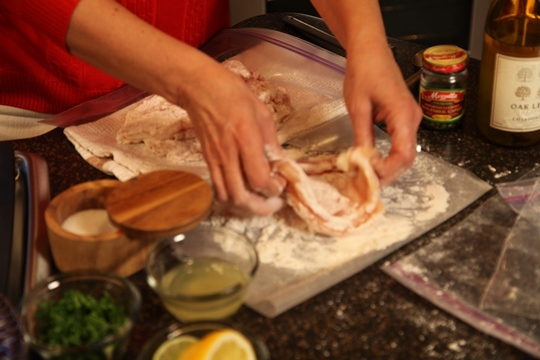 Here is a favorite recipe of mine…It is so fast and easy! With just a few simple ingredients, your guests will be asking for seconds! Cut open one side on 4 large zip lock bags. 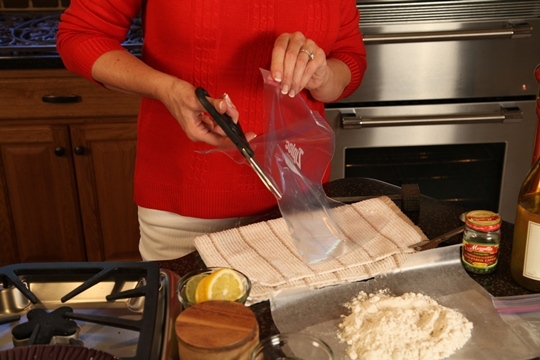 Place one chicken breast inside each zip lock bag. 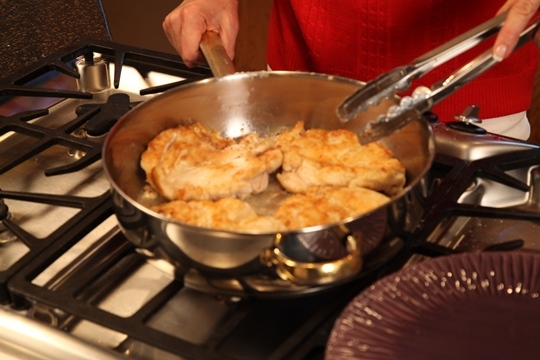 Pound each chicken breast to ¼ inch thickness with the flat side of a meat mallet. Coat chicken on all sides with flour. Heat oil and butter in a large skillet. Add chicken. Brown quickly on both sides - about a minute or so on each side. Remove to a platter. Sprinkle with salt and pepper. Add wine, capers ( drained) and lemon juice to skillet. Heat to a boil, scraping down the sides and bottom of the pan. 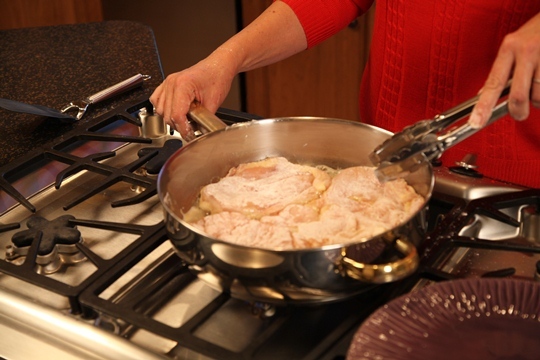 When 4 tablespoons remain, pour over the chicken breasts. Sprinkle with chopped fresh parsley and garnish with lemon and lime slices. Cut open one side on 4 large zip lock bags. 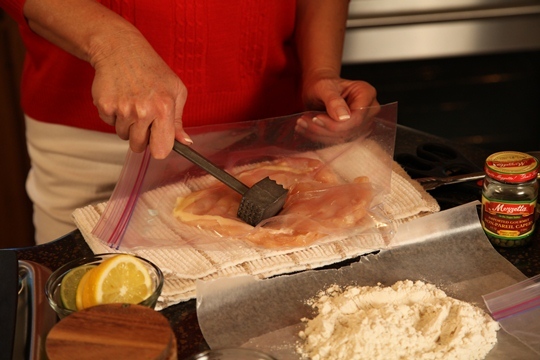 Place one chicken breast inside each zip lock bag and pound the chicken breast to 1/4 inch thickness using the flat side of a meat mallet. 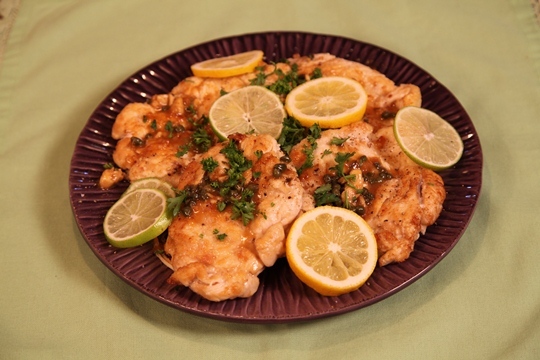 Coat chicken breasts on all sides with flour. Heat oil and butter in a large skillet. Add the chicken. Brown quickly on both sides – about 1 minute or so on each side. Remove to platter. Sprinkle with salt and pepper. 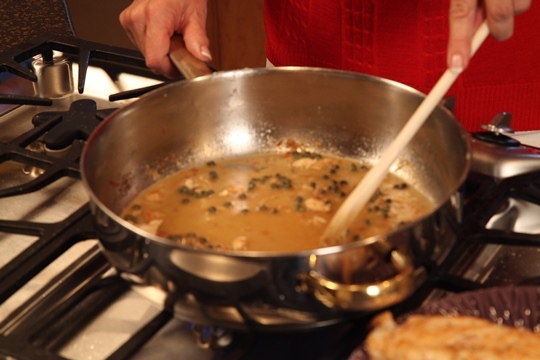 Add wine, capers and lemon juice to the skillet. Heat to a boil, scraping down the sides and bottom of the pan. When 4 tablespoons liquid remains, pour over the chicken. Sprinkle with the fresh chopped parsley and garnish with the lemon and lime slices. Enjoy!